Mine weren’t for use together, but as alternatives. One at a time. My question was about plugging one port when it’s not used. Mike, they are not aggressive to us, but they can get a bit cranky with strangers, especially if there are chicks about. A few that my wife hand raised are very friendly and follow her around. We have a few that we put under a bantam and she hatched them out and cared for them. They were almost adult size before they realised they were not chooks and joined the guinea flock. Horse, I agree. Great bug controllers and they give any snake that happens by a hurry-up. Das, your one guinea fowl will be lonely. They really are a flock bird. Pity I can't mail you a few. Frosty, they reproduce at an alarming rate, but survival rate is not good, especially in stormy weather. They are not good mothers. And as for alarming procreation, well the dog gets a bit concerned over the action and attempts to separate them. I guess she believes there's an act of aggression going on. She's the same with the chooks. Cool. Looks like something a gun smith would come up with. I like the can forge idea. I will have to try it. As to figuring out the cubic inch capabilities, I will have to build a handful of forges in varying sizes to test that. 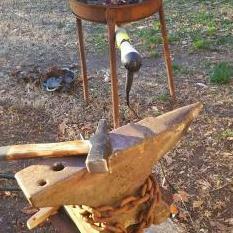 I have never pushed any burner to it's limits as I would rather plan some head room and know a forge can get hot enough. We have the monster 450 in³ forge with the two 1/2 inch burners which runs very hot but we have not tested it's forge welding capabilities. We run the burners at 5 psi for higher orange forging temperature so I suspect it will forge weld without problems. I tend to like "small" forges so the 1/2 inch burners are my go to but I have functioning 1/4 inch, 3/8 inch, 1/2 inch, and 3/4 inch burners. I guess 1 inch is the next step. Maybe work my way up to 2 inch for all the new guys with the 55 gallon drum forges. Lately it has been mostly nozzle design and learning about investment burnout for the casting. That would be a no-no; all hat gasswirling in one direction pleas... Lets try that mess again. All hot gases swirling in one direction please. Yes; its an easy fix now, but would be a sad mess later With the burner and forge designs coming on line these days, yesterdays little booboos aren't any longer. Frankenburner is going to need to prefigure cubic inch formulas--especially with smaller burner sizes-- for his design. I was content to let them stand with my hotter Mikey burners, but his flame temperatures are going to need a whole new ballpark!!! how much? I'm thinking a third hotter! Also make sure the hardy's fit correctly without any taper that would put undue stress on the sides of the hardy hole. Here’s a pair I made to those instructions a little while back. Great job on those Poz tongs TRR1143: I watched that video as well, and have been wanting to try my hand at his design. TY Mikey98118, Not to late to adjust. Easy fix. You mean V8 can forge? Picture a blacksmith wreathed in a cloud of yellowish brown smoke slapping his head. The caption reads, "Gosh I coulda had a V8!" What, no dialogue bubble? Nope, it's obscured by the smoke. Frosty The Lucky. Finished a set of Poz Tongs today for 3/8" stock, derived from the instruction from Black Bear Forge. I really like the style and they turned out decent enough. I'll make another set sized for 1/4" soon. I noticed something recently that I would like to add to this conversation. I have had my model 12 for around 5 years and love it (admittedly light use with two moves and two kids in that time span). I recently bought a bottom tool with a long shank, and it wouldn't seat down all the way onto the anvil surface. It turns out that the the hardy hole is not square all the way, but rather is only a circular hole towards the bottom. I'll have to file or grind out the last bit to use longer bottom tools. The hardy hole is square for approximately 3 3/8" and circular for approximately the bottom 1 1/2". Yes I just vomited a few things into the page. I want to get a sense for some of the details. So, how the two insulators will interface and how the burner port and door openings will work. That’s was the main (largest) side-section. It shows a tube for a thermocouple entering the forge next to the burner. It shows the refractory encapsulating the front edge of the forge and extending past it a bit. Then I started thinking about a door by supporting a couple fire bricks at either end with a sideways shelf. Then I started thinking about a pivoting door that could swing up. And a cart. All made the page just to keep it compact for me. I can make a cleaner one of the main section at least. Really I should just model it in Fusion360. I thought such ports were arranged axially whereas mine will fire roughly at each other. I’ll give it a shot though. YouTube channel Pretty amazing stuff there. I'd like a look at your concept sketches but that page is awful cluttered. Would you mind breaking it down to just one pic with a plan and side view per page? At this stage sketching ideas I figure a lot of things out by drawing it a couple few times on graph paper. I LOVE graph paper, it's the shop guy's friend. Frosty The Lucky. In fact we suggest it as a standard move with larger forges. I would suggest the opening sizes you already choose, for your REFRACTORY openings, with your steel shell kept another inch away from those openings. Planning to do collars. It’s about 35” wide, to keep the dogs in the family room. Here are some further ideas I’m considering for the build. Gas forge vs. Coal/coke forge? Skim both threads first. Then read them closely to answer the " but, wait a minute" questions until they go away by themselves. I don't see any collars so rivets? Or will you just arc weld it? I do like the concept.. Sizing? Thank you I will definitely look into the burners 101 and forges 101. Also if anyone else reads this I'm in the Tulsa, Oklahoma area of anyone cares and wants to let me contact them.